They say success is 10% inspiration and 90% perspiration, but that just sounds like somebody has a problem with overactive sweat glands. 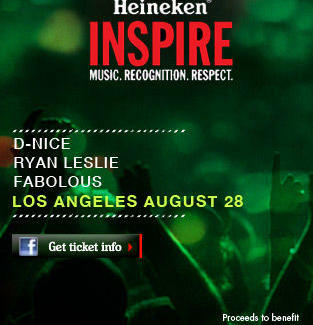 Be all about the inspiration, at Heineken Inspire LA. Inspire LA is a two-day music extravaganza featuring some of today's toastiest bands -- and, you can attend for free with a donation of at least $1 to the charity Life Rolls On. Make a donation online, and you'll catch exclusive shows by artists from rock poets The Hold Steady to Fabolous, a Brooklyn native who's clearly not a fan of The U. There's also bonus fun including plenty of food & beer, Wii games, Fender guitar lessons, and a Rolling Stone magazine photo booth, which hopefully for your sake will not be set up by the Wii. To get the complete rundown of artists performing (there are a lot more), and to make your donation, just "Like" Heineken Red Star Soul on Facebook -- you can do it, no sweat.